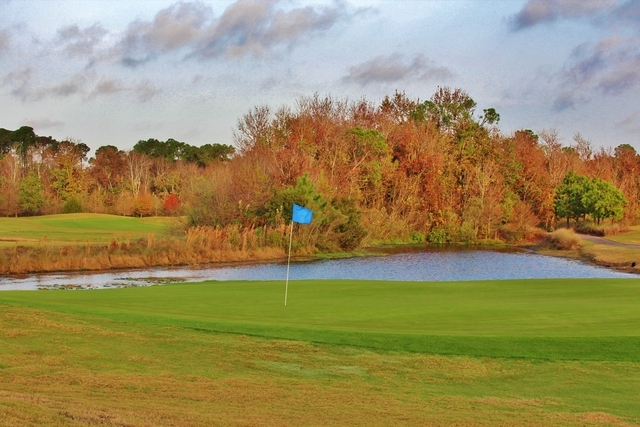 Orange Lake Resort offers four golf courses, including the 18-hole Reserve Course. 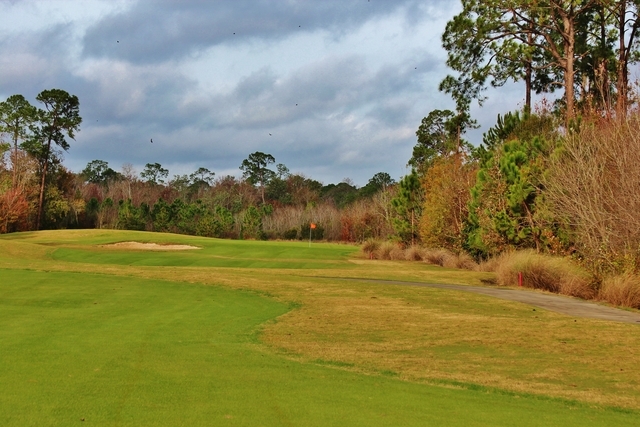 The Reserve Course winds through a diverse landscape of water, sands, and rolling hills. 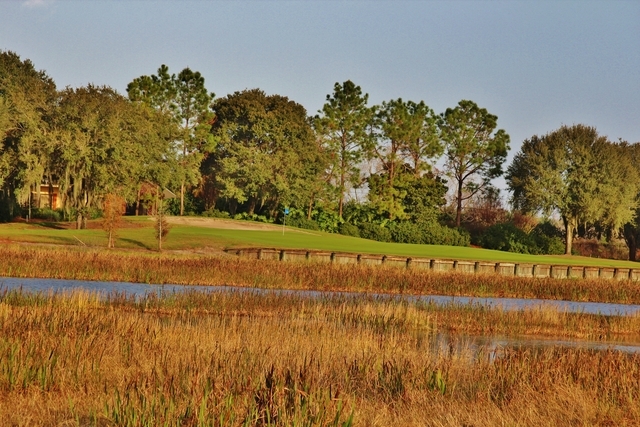 The golf course is surrounded by preserved wetlands, offering golfers scenic views of native plants and wildlife. 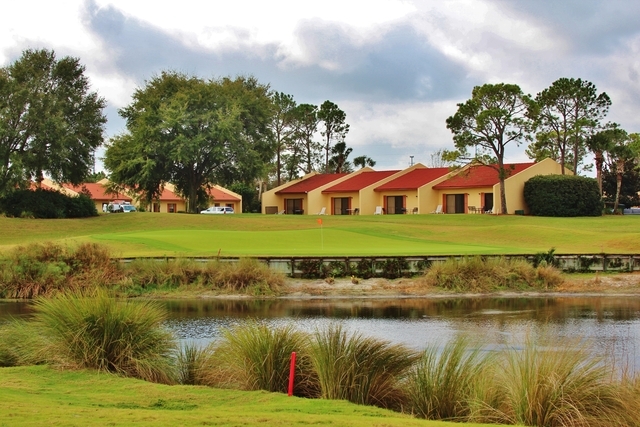 Orange Lake Resort offers four golf courses, including the 18-hole Reserve Course. 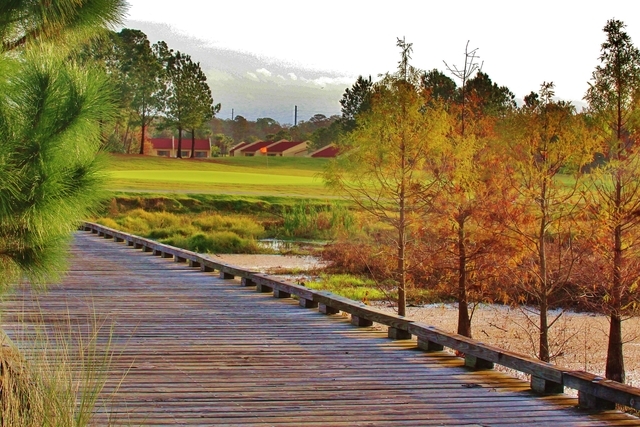 The Reserve Course winds through a diverse landscape of water, sands, and rolling hills. The golf course is surrounded by preserved wetlands, offering golfers scenic views of native plants and wildlife. One of the most unique holes on the golf course is the par-3 12th hole, which requires an accurate tee shot in order to make par. Although it is the shortest hole, it is one of the most difficult with two deep bunkers surrounding the green to the left and water hazards at the right. In addition to the four golf courses, Orange Lake Resort has a lighted driving range and putting green for golfers to use. 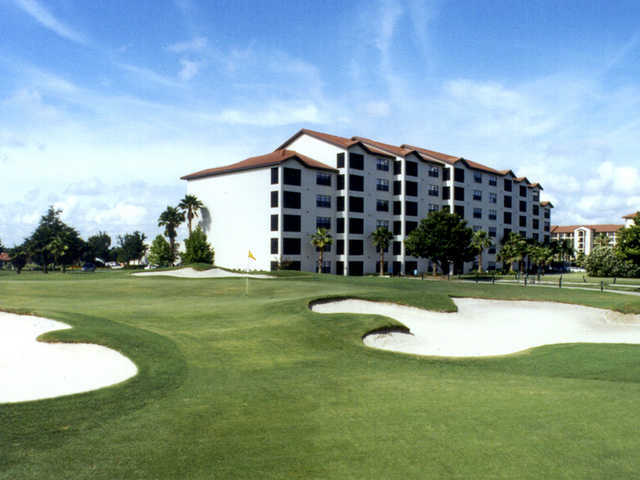 Golf school / golf academy: Yes - "The McCord Golf Academy"
A lot of families that visit the Orlando area are familiar with Orange Lake Resort and their upscale condominium style accommodations, villas and time share units. The resort also features a full array of amenities including swimming pools, tennis courts, mini golf, a workout facility, meeting/conference areas and multiple dining options. But what they may not be aware of is that Orange Lake Resort also boasts two of the area’s best conditioned and challenging championship golf courses: The Legends Course and The Reserve Course. Best of all, you don’t have to be a resort guest to play here, these courses are open to the public. 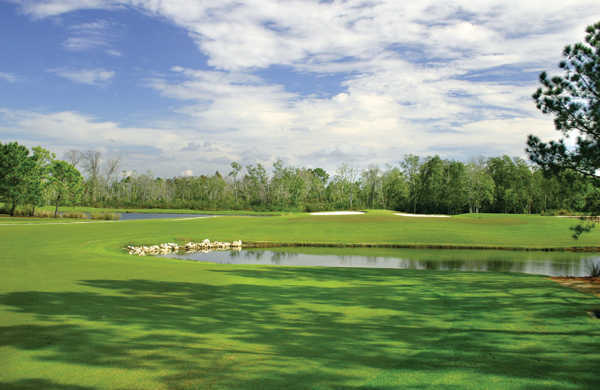 The Reserve Course could be considered both the oldest and the newest course at the resort. It was originally designed by Joe Lee in 1982, 16 years before Arnold Palmer and company designed the Legends Course. In 2005, golf course architect Mike Dasher completely redesigned the layout, adding new water features and more sand, as well as rerouting and redesigning seven holes. The result is one of the more challenging courses in the Orlando area. There are only three sets of tees on the Reserve Course, but not to worry, they’re suitable for just about everyone. 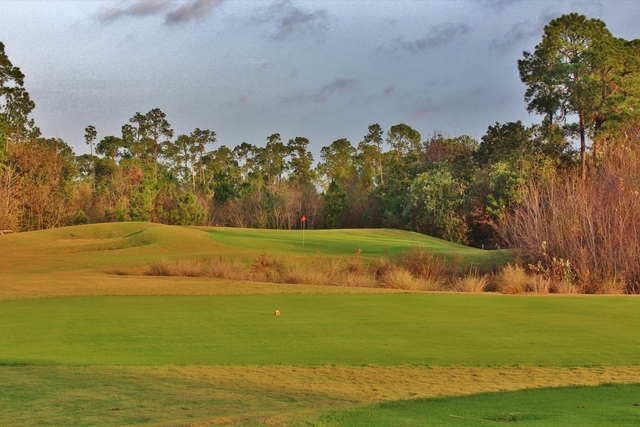 From the tips (Blue Tees), Orange Lake measures 6,505 yards with a course rating of 71.8 and a slope of 137. Most players will find the White Tees (6,031 yards/69.4/118) quite challenging, while Ladies and Seniors will find the Yellow Tees (5,119 yards/68.3/1) an enjoyable distance to play from. The Reserve Course plays to a par of 71. As you make your way around the course, you’ll see pristine wetlands around many of the green complexes. You’ll also see a wide variety of Florida plants and wildlife. As mentioned earlier, Dasher added several water hazards and a lot more sand, in the form of both bunkers and waste areas. There’s a fair amount of roll and undulation in the fairways as well as on the new MiniVerde putting surfaces. Most Memorable Hole: Number 10. Par 5, 504 yards (White Tees). Number 10 is undoubtedly the most interesting hole on the course. This long dogleg left starts out with a tee shot over a lake to a fairway that features a trio of bunkers straight away. Short of the bunkers is good, left, not so much. The right side of the fairway should be avoided too; there’s a stream that runs down the right side and then cuts across the fairway to another lake on the left that needs to be navigated on your approach shot. Plan on favoring the right side of the fairway with your layup shot, just be warned, it’s a narrow landing area. Then. play your approach shot over the second lake to a well-elevated green protected on the right by a large deep bunker. Make a par – or better – and consider the round a success! Favorite Par 3: Number 5. Par 3, 171 yards. A long par 3 with a bailout area - if you need it. From the tee, it’s all carry over the marsh. Even if you bail out to the right, you’re still going to have to get over the marsh area off the tee. Bailing out is no sure thing either; there’s a large bunker over there that makes up and down extremely difficult. Once you get on the green, pay close attention, there are a lot of subtle little breaks. Favorite Par 4: Number 18, 36 yards (White Tees). A fitting end to a great round. This dogleg left features a cluster of bunkers in the landing area and a wall of trees to the left. The good news is that the tree line can be carried off the tee, the bad news is you’ll have to land the ball between a large pond and the cluster of bunkers. A good drive will leave a mid to short-iron approach shot to a large green with some subtle undulations. Favorite Par 5: Number 4, 531 yards. Should you succeed, this long, demanding par 4 is a well-earned par. The tee shot requires a forced carry over a marshland to a fairly large landing area with bunkers and condos on the right side. Because of the length and shape of the hole, most players play this as a three-shot hole. The landing area for your layup shot is narrow with a large bunker on the right side. The large green is fronted by a large bunker and features a lot of undulation. This is another hole where par is a well-earned score. Last Word: This Mike Dasher design has a lot to offer golfers of all abilities. It’s definitely not the longest course in the area and is certainly not going to overpower anyone. What it will require is that you think your way around the course, especially on holes like the par 5, 10th, which takes accuracy, length and brains. Another interesting hole is the par-3 12th hole, which requires an accurate shot off the tee in order to have a shot at par. It may be the course’s shortest hole, but it is also one of the most difficult too, with two deep bunkers surrounding the green to the left and water hazards on the right. Miss the green and par is a tough score to make. The Reserve Course shares a clubhouse with the newly renovated Cranes Bend, an executive style nine-hole course. The clubhouse features a well-stocked pro shop plus a restaurant/lounge. Also on property is Legends Walk, a lit par three nine-hole course that takes tee times until 9 PM. There’s plenty of room to tune up your game and includes a spacious driving range nearby that is open late. The practice facilities also include a large practice putting green. Although a fair amount of The Reserve Course winds through the resort community, many of the holes have nothing but nature around them and are very secluded. 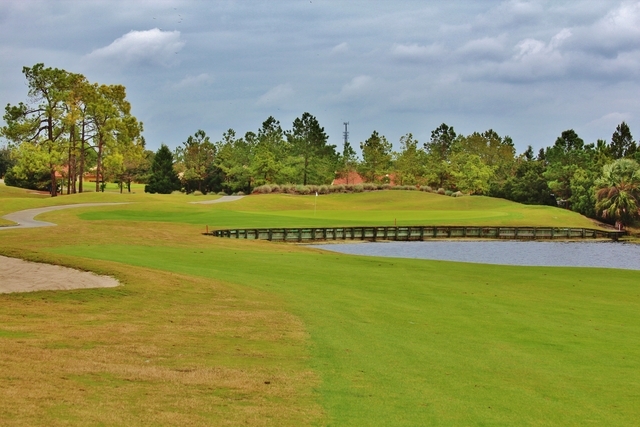 If your goal is to find a golf course in the Disney area that will challenge your golf game and don’t want to break the bank to do it, pay a visit to the Reserve Course at Orange Lake Resort. Aside from dirty and unorganized the course is so badly kept and it was very disappointing. The cart girls were the bright side. Course was in fine shape, and the customer service was top notch every time. The price of golf was excellent as well. Up at home you are never gonna golf 2 prime courses and get rental clubs for the price we got here. Just another reason for the high score. Greens were in great shape, fast and slopes tricky. Had a great time. You will need to pay attention to the water hazards if you want a good score. Great staff. 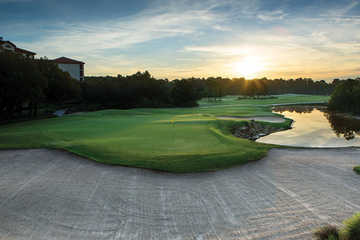 One of the best golf experienes we have had in the Orlando area. Best value for the money so far. No marked yardages on range, don't bring your laser range finder, no reflectors on the pins and no course map that shows hidden water hazards. So if you want to dial in your distances before play, stop at another range. If on course distance is important to you, bring GPS. On the positive side, well maintained and fun to play. Decent Value. 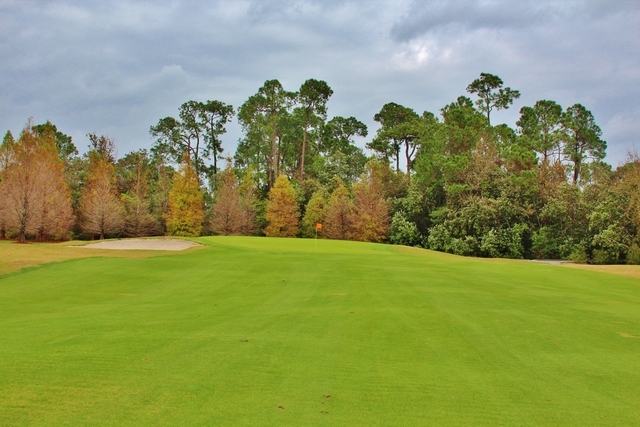 The staff and course have to be the best kept secrets in Florida. Every little detail is accomodated. The course will make you play your "A" game so make sure you pack in your bag. Kemmons hired the right people to build this dream resort. Once you visit, you never want to leave. Six stars if I could.